The Presidential Election is set for 26 October. 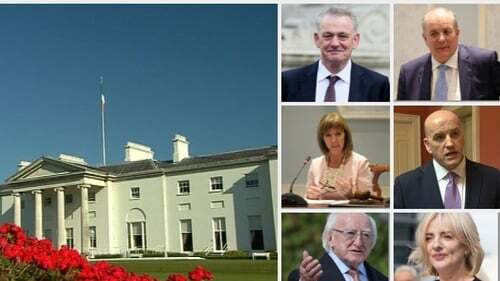 Here are the six candidates currently in the race for Áras An Uachtaráin. The closing date for nominations is 26 September. Presidential election hopefuls must secure the support of four local authorities or 20 TDs and senators to stand in the election. Derry businessman Peter Casey is the third Dragon's Den investor to receive the endorsement of four local authorities to enter the race. Mr Casey runs global recruitment firm Claddagh Resources. It operates from five locations across the world, including its European base in Buncrana, Co Donegal. He divides his time between Atlanta in the US and Ireland. Speaking previously about his campaign to be president, Mr Casey said he was not running to lose and was prepared to spend up to €750,000. The entrepreneur and businessman from Sallins, Co Kildare, is best known for his role on the RTÉ programme Dragon's Den. Mr Duffy has worked in the past as an adviser to both Fine Gael and Fianna Fáil but he is running as an Independent. Joan Freeman is a psychologist and mental health activist from Dublin. The 60-year-old has also served in the Seanad since May 2016 after being nominated by the then taoiseach, Enda Kenny. She is the chairperson on the committee on mental health. Senator Freeman founded Pieta House, a suicide intervention charity, in 2006 in Lucan, Co Dublin. It now boasts 12 additional centres around Ireland. She is running as an Independent. The 56-year-old businessman and former former Dragons' Den star from Ballyhaise, Co Cavan, finished second in the 2011 Irish presidential election. He secured more than 500,000 first preference votes, but lost out to Michael D Higgins. Mr Gallagher has described himself as coming from the "Fianna Fail gene pool", but is running as an independent. He entered the political arena in the late 1960s joining the Labour Party and served as a senator in the 1980s before representing Galway West in the Dail from 1987 to 2011. Mr Higgins was elected president in 2011 after running as the Labour Party candidate. He is running as an Independent candidate in this election. The Sinn Féin politician was elected to the European parliament in 2014 for the South constituency. The 51-year-old was born in Dublin but lives in Co Cork. She was a television producer and director, having worked for RTÉ and TG4, before entering politics. She was a member of the board that set up TG4 and is a fluent Irish speaker and Sinn Féin’s National Gaeilge Officer. She was nominated to run in the Presidential Election as she has the backing of at least 20 members of the Oireachtas, namely her party Sinn Féin.